Knowing how to register an emotional support animal isn't common knowledge. In order to identify a trustworthy website and legitimize the look of your emotional support dog, you need to do your homework. ESA dog registration is easy, quick, and affordable, and this page will provide you with the answers you need to be informed about our emotional support animal registration process. 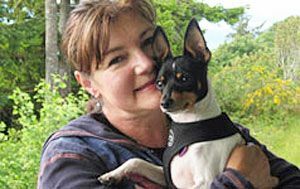 This page also covers your legal rights and protections with your emotional support animal to help you live with your pet in no-pet housing with no fee and to fly with your ESA in the cabin of an aircraft without being charged a pet fee. 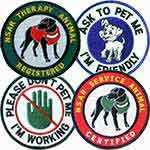 We're also happy to help you learn more about receiving your emotional support animal certification for your ESA dog. We make it easy to register an ESA dog that can get your animal the proper certification and equipment it needs in no time. Trying to navigate the emotional support dog certification and registration process on your own can be a daunting experience. We hope to help others by providing them with the information, resources, and products they need to protect and provide for their emotional support animal. An emotional support animal (ESA) is a person's pet that has been prescribed by a person's licensed therapist, psychologist, or psychiatrist (any licensed mental health professional). 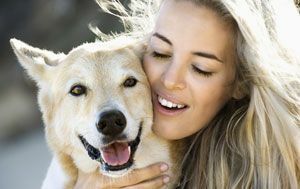 The animal is part of the treatment program for this person and is designed to bring comfort and minimize the negative symptoms of the person's emotional/psychological disability. If not currently working with a licensed mental health professional, please visit our recommended company Chilhowee Psychological Services (CPS) for legitimate and highly accredited licensed mental health professionals who may qualify you and specialize in writing these letters for airlines and property managers. Registration is voluntary; not a legal requirement. Registering your pet as an ESA, however, not only legitimizes your ESA (making him/her look official), but helps eliminate the hassles and confrontation you'll encounter without it. 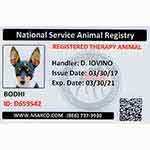 That's the purpose of National Service Animal Registry (NSARCO): To make life easier for disabled persons who travel in public with emotional support animals. Do You Have a Therapist? What Animals Qualify to be an ESA? All domesticated animals may qualify as an ESA (cats, dog, mice, rabbits, birds, snakes, hedgehogs, rats, mini pigs, ferrets, etc.) and they can be any age (young puppies and kittens, too!). These animals do not need any specific task-training because their very presence mitigates the symptoms associated with a person's psychological/emotional disability, unlike a working service dog. The only requirement is that the animal is manageable in public and does not create a nuisance in or around the home setting. The Air Carrier Access Act 49 U.S.C. 41705, Dept. of Transportation 14 C.F.R. Part 382, Fair Housing Amendments Act of 1988 are the laws that protect an emotionally disabled person and his/her ESA. Fly with its emotionally or psychologically disabled handler in the cabin of an aircraft without being charged a pet fee. 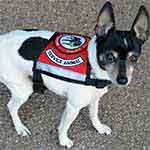 Click here for detailed information on Flying with Your Emotional Support Animal. Qualify for no-pet housing (that also includes limited size, breed, or species housing) without being charged a pet fee. Click here for detailed information on Housing Rights For You And Your ESA. No other public or private entity (motels, restaurants, stores, trains, taxis, busses, theatres, parks, beaches, libraries, zoos, etc.) 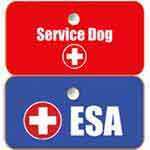 is required to allow your ESA to accompany you and in all other instances, your ESA has no more rights than a pet. That means they aren't protected by law to accompany you into any public place that does not allow pets. That doesn't mean these places won't let you, it just means that they are not required to, by law. To find out more about or begin to register your Emotional Support Animal (ESA), Click Here. We guarantee your life will be enhanced, as a result! Registration is voluntary; not a legal requirement. Registering your pet as an ESA, however, not only legitimizes your ESA (making him/her look official), but helps eliminate the hassles and confrontation you'll encounter without it. That's the purpose of National Service Animal Registry: To make life easier for disabled persons who travel in public with emotional support animals. It's a breeze for you to fly the friendly skies with your Emotional Support Animal (ESA)! You'll just need a few things to enjoy smooth sailing, based on the Air Carrier Access Act and recommendations of all USA-based airline companies. The Air Carrier Access Act is a federal law that requires airline companies to allow emotionally impaired persons to be accompanied in the cabin of the aircraft with an emotional support animal and not be charged a fee. Click here for detailed legal information about Flying with Your Emotional Support Animal. 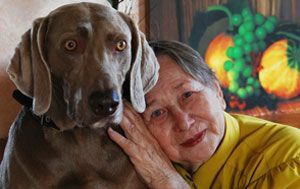 If a person is emotionally or psychiatrically impaired (disabled) and an emotional support animal prescribed by a licensed mental health professional), the Fair Housing Amendments Act of 1988 requires the landlord/property manager to make a reasonable accommodation to their policies and allow the tenant to have an emotional support animal. There are no specified limitations with respect to species, breed, or weight policies. That means if they have a "cats only" policy, they must accept your emotional support animal if it is a dog. If they have a policy that allows dogs weighing no more than 30 lbs. and your emotional support animal (ESA) weighs 75 lbs., they must make a change in the rules to accommodate you. If they accept all dogs, except pit bulls, and you have a pit bull, they must allow your pit bull to reside with you. Click here for detailed legal information on Housing Rights for You and Your ESA. When you travel with your ESA and plan to go to hotels, restaurants, stores, and use public transportation (other than airplanes), your ESA has no legal protections and is regarded as a pet. 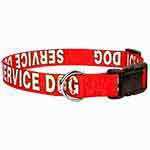 If your dog has an ESA vest, ID card, etc. 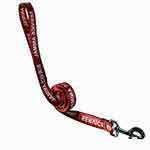 that formalize the dog's look, many public places will simply allow your ESA to accompany you anyway.